Yang Jian is a practicing Buddhist and scholar of Chinese traditional culture. 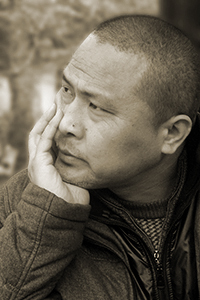 He is the laureate of the Yiu Li’an Poetry Award (1995), the Rougang Poetry Award (2000), the Yulong Poetry Award (2006), and the prestigious Chinese Media Literature Award (2008). His books of poetry include Dusk (Hebei Education Press, 2003), Ancient Bridge (Shanghai Culture Press, 2007), and Remorse (Taiwan Tangshan Press, 2009).